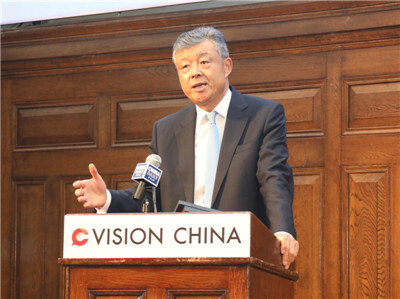 It is a real delight to join you at China Daily's 5th "Vision China" talks. As we celebrate the 40th anniversary of China's reform and opening up, the "Vision China" talks could not have been more timely. It gives us a good opportunity to talk about the vision for China and the world 40 Years on. First, what are the reasons for the success of China's reform and opening up? Second, what does China's reform and opening up in the new era mean to the world? Third, what does China have to offer to the international community through its further reform and opening up? President Xi Jinping said, reform and opening up, which is China's second revolution, has not only profoundly changed the country but also greatly influenced the whole world. Forty years ago, China's GDP was $175 billion. Today, it is more than $12 trillion, increasing by 68 times. In forty years' time, China has grown from the tenth to the second largest economy in the world. In forty years' time, China's population living in absolute poverty has dropped from 770 million to a little over 30 million. This means 740 million people have been lifted out of poverty, accounting for more than 70% of world poverty reduction in the same period. In forty years' time, China has built the world's largest social security network, with a basic pension insurance system covering more than 900 million people and a basic health insurance system covering 1.3 billion. In forty years' time, China has become the world's largest exporter and second largest importer. It has contributed more than 30% of world economic growth for many years. It has been a stabilizer and powerhouse for world economic recovery. Such remarkable success in such a short period of time is by no means a matter of luck. I believe it should be attributed to China's down-to-earth approach, undaunted courage, and open and inclusive attitude. First, China has been down-to-earth in exploring its own development path. In reform and opening up, China has no precedent to go by. From rural to urban reforms, from pilot projects to wider introduction, and from economic restructuring to deeper reforms across the board, the only benchmarks for China are its national condition and development needs. To use the famous metaphor of Deng Xiaoping, we have "crossed the river by feeling the stones". Over the past 40 years, China has taken solid steps, made concrete progress and blazed a trail of development and reform with Chinese characteristics. The most valuable lesson we have learned in this process is this: While we must dream big and bear in mind the people's aspiration for a better life, it is equally important to stay down-to-earth, take solid steps and deliver. Second, China has been courageous in the self-revolutionary reform. Reform is a process of addressing contradictions and problems. Therefore, it is important to have the courage of self-revolution. Around the world, there is often more empty rhetoric than concrete actions targeting at one's own problems. The Chinese people believe in concrete actions because we think this is what makes a country prosper. In advancing reform and opening up, nothing is more precious than our courage to face up to bitter contradictions and problems. We have continuously shattered the shackles on thought and removed the hurdles to development. We have the resolve to settle the problems, tackle the risks and carry the reform through to the end. Third, China has embraced the world with an open and inclusive attitude. Openness brings progress and isolation results in backwardness. This is a hard lesson that China has learnt from its recent history. We have learnt this lesson, and we have for 40 years adhered to the basic policy of opening up. We have turned China from a closed and semi-closed country to one that opens up on all fronts. Such openness has prompted more reforms. From acceding to the WTO and adopting international economic and trade rules to establishing pilot free trade zones and putting in place the system of pre-establishment national treatment plus a negative list, further opening-up has been driving domestic reform. Moreover, greater openness has facilitated further development in China and around the world. Opening up has given China's development the benefit of foreign capital, experience and expertise. In turn, China has been sharing the benefit of its economic growth with the world through expanding investment overseas. Without reform and opening up, China would not have come so far. Without deeper reform and further opening up, China would not be able to create a brighter future. Now let me turn to the second question: what does China's reform and opening up in the new era mean to the world? First, it enables China to share its solutions with countries in search of development paths. As a Chinese saying goes, only the wearer knows whether the shoes fit or not. In reform and opening up, there is no textbook approach. One has to try to see if the relevant measures are suitable. That is what China did. We adhered to the path of our own choice and found the way that worked for us. China's success expands the road to modernization and contributes to the wealth of social systems and governance experience of mankind. China stands ready to share its success stories in reform and opening up with other developing countries, enhance exchanges on governance and achieve common development. Second, continued reform and opening up in the new era will enable China to offer its wisdom to a world of evolving economic landscape. In this world, new growth drivers are fast replacing the old. Anti-globalization, protectionism and unilateralism are rising. World economic recovery faces increasing uncertainties and instabilities. Free trade and the multi-lateral trade regime are under severe threat. Where is the way forward for globalization? With renewed commitment to reform and opening up, China is pointing to the right direction. China's continued reform will focus on the economic structure. This means there will be more emphasis on innovation as a driver of development as well as a focus on tapping the potential, activating the economic vigour and strengthening the domestic impetus for growth. This will enable China to seize the new round of scientific, technological and industrial revolution to achieve development. China is at the same time committed to open cooperation with the world. Our goal is common prosperity and sustainable development. We would strive for an economic globalization that is more open, inclusive, balanced and win-win for all. Despite the evolving economic landscape, globalization cannot be turned back, just as it is impossible to channel the water of the ocean back into isolated lakes and creeks. China stands firmly against protectionism and unilateralism. We are ready to work with other countries in the world to safeguard an open world economy and the multi-lateral trade regime. Third, continued reform and opening up in the new era will enable China to contribute its ideas to the reform of the global governance system. The world is experiencing profound changes unseen in a century. There is a rising call for reform in the global governance system. China is not only a beneficiary but also a participant and defender of the existing international system. But we are ready to answer the call of the international community and work to make the global governance system more fair and reasonable. To this end, China proposed to build a new type of international relations featuring mutual respect, fairness, justice and win-win cooperation. We call for the building of an open, inclusive, clean and beautiful community with a shared future for mankind. It is a community of lasting peace, universal security and common prosperity. China has also proposed the Belt and Road Initiative. And it contributes to filling in the rules, ideas and development gaps in the global governance. Going forward, China will carry out the new round of reform and opening up with greater determination and courage. The pressure for reform can be turned into a driving force. This will in turn lead to concrete actions and firm and steady steps to advance reform and opening up according to its overarching goal and roadmap. I believe China's reform and opening up will create three big opportunities for the international community. The first opportunity is a powerful engine for growth. With further reform and opening up, China's economy will continue to growth steadily. This will enable China to remain as a powerful engine for world economic growth and common development. In the first half of this year, China's economy grew by 6.8% over the same period last year. This means China has maintained 6.7-6.9% growth rate for 12 consecutive quarters. This coming November, China will host the first-ever International Import Expo. This is not just another expo. It is an important measure of China to invite all countries in the world to share its development opportunities and benefits. The UK is one of the countries of honour at the Expo. 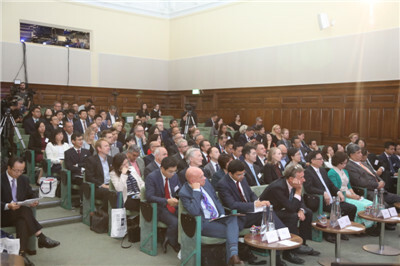 China welcomes a strong presence of British companies in Shanghai to showcase British products and services to the Chinese market. The second opportunity is a big market. With the world's largest middle-income population, that is, about 400 million, China has a huge market. In next 15 years, China will import $24 trillion of goods. Take the automobile industry for example. China is now the world's largest consumer market for automobiles. The production and sales of automobiles has topped the world for nine consecutive years. On 1 July this year, China cut import tariffs on automobiles and some consumer goods. This has not only met the upgraded consumer needs in China but also created new opportunities for foreign companies to expand their business in the Chinese market. China has also been working vigorously on market access in the financial and manufacturing sectors, investment-friendly environment and IPR protection. These measures are all aimed at facilitating foreign businesses and investments in China. The third opportunity is a major platform. This major platform is the Belt and Road Initiative. Five year after President Xi Jinping proposed this Initiative, the BRI has made enormous progress. Over 10,000 China Railway Express trains have run between China and 43 cities in 15 European countries. Trade in goods between China and countries along the routes have exceeded $5 trillion. China has invested over $20 billion in economic and trade cooperation zones along the routes. These zones have created over 200,000 jobs locally and contributed billions of dollars of tax to host countries. Born in China, this Initiative is already serving as a platform for cooperation and delivering benefit to the whole world. Next year, China will host the second Belt and Road Forum for International Cooperation. We welcome the participation from our British friends at this Forum. History never favours the complacent who refuses to innovate. Opportunities always belong to the audacious who embraces innovation and change. 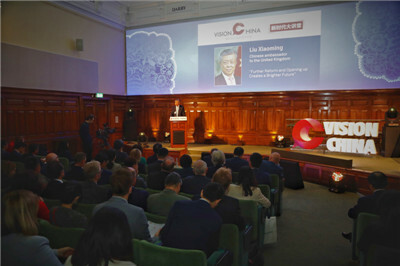 I sincerely hope that China and the UK will follow the trend of the times, and seize the invaluable opportunities of China's further reform and opening up in the new era. Together we will create a brighter future.